Mr. Masataka Fujita, Secretary General of the AJC gave a lecture at the University of Tokyo on December 13, 2018. It was a lecture organized in response to the request by a lecturer of the University, and conducted for the students taking a class on politics of Southeast Asia from the College of Arts and Science. In the lecture titled “Introduction of ASEAN and New Era of ASEAN-Japan Economic Relations”, SG Fujita elaborated on evolving ASEAN-Japan relation and their economic relations from the perspective of the Global Value Chains (GVC). He explained that although ASEAN-Japan relations in terms of trade, investment and tourism statistics have shown a relative decline of Japan’s presence in the ASEAN Member States, its importance still remains high. Meanwhile, the presence of ASEAN in Japan has grown unabated. He mentioned that the declining share of Japan in the region is largely due to the change in Japanese companies’ business strategies which shifted more to direct production in the ASEAN region rather than exports of products from Japan; and Japanese companies are spearheading in creating regional value chains. The lecture was well-received by the students as SG Fujita received many insightful comments and questions from them, including those on foreign workers from the ASEAN region and competitive industries in Japan. Even after the lecture, some students took the opportunity to make further queries to SG Fujita. 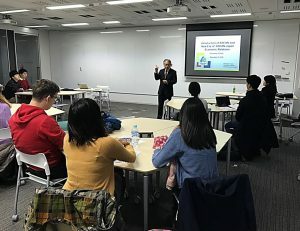 The AJC will continue to step up its efforts for on-site lectures at universities, as it believes that the lectures serve to boost and stimulate Japanese youths’ awareness on the ASEAN as well as its member states.